Virender Sehwag’s batting has always exuded a reckless abandon for unnecessary complications, such that he can achieve what others cannot even conceive. Therefore, it is hardly surprising that he can replicate MS Dhoni’s famous helicopter shot when he is on his own individual fifty. In the MCL match on Friday when Sehwag’s Gemini Arabians beat the Sagittarius Strikers on the back of his rampaging 63-ball 134, he reached both his fifty and his hundred with two special shots. Well asusual SIX to bring up 50 for Sehwag ! But can you name this shot ?? SEHWAG bring up his 100 with a HUGE HIT !! 100 in just 47 balls ! Take a bow Sehwag !! After winning the toss, Sehwag had no hesitation in choosing to bat and the former Indian opener started like a house on fire. He helped them cross fifty in the fifth over and brought up his own half-century in just 24 balls, same as the previous game, where he set the record for the fastest fifty, which was later broken. 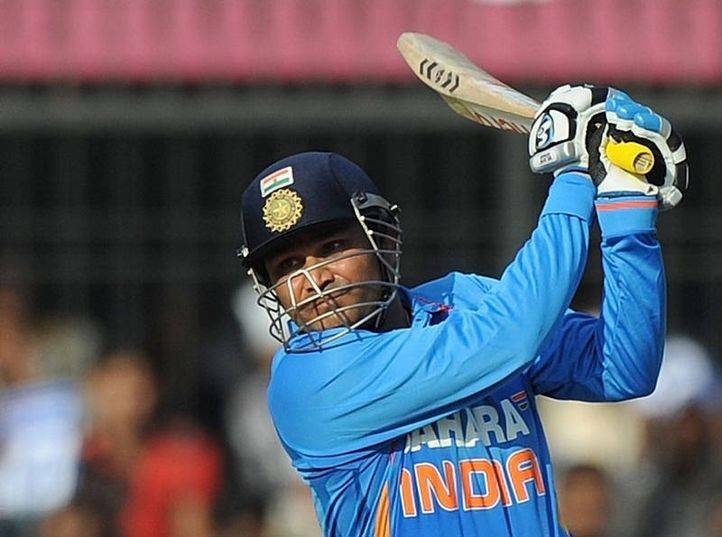 Sehwag brought up the fastest hundred of the tournament as he smashed his ton off just 47 balls.